On behalf of the employees of the Medina County Sheriff’s Office, welcome to our official web page. As our mission states, it is our goal to provide safety and security to the citizens and communities of Medina County in a cost effective manner. Providing information to the public via the internet is just another tool to assist us in meeting our mission. The men and women of the Medina County Sheriff’s Office continue to take pride in their ability to serve. We trust you will enjoy your visit to our site! If you have any recommendations to improve our service, please don't hesitate to make suggestions. The Medina County Sheriff's Office has implemented an online scheduling system for citizens to schedule appointments to obtain a new or renewal CCW permit or Webcheck. Appointments will no longer be scheduled over the phone. Please view the information for obtaining a CCW permit or Webcheck by scolling over the General Information link to the left before scheduling your appointment. Below is a link to the new scheduling system. The Medina County Sheriff's Office in conjunction with the Medina County Drug Abuse Commission and the Medina County Drug Task Force is pleased to announce the implementation of a full time prescription drug turn in program. 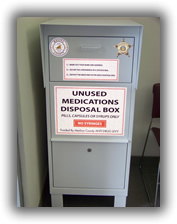 Located in the lobby of the Sheriff's Office, a secure collection box has been placed to accept all unwanted and/or expired medications. the information on the prescription label. Ensure that all bottles or bags are securely closed. Place all items in a clear zip lock bag. Deposit into the collection box. DO NOT DEPOSIT ANY NEEDLES OR SHARPS. These items will not be collected. The Medina County Sheriff's Office has joined the social networking site, Twitter. If you would like to be notified immediately of important events in our county such as snow emergency levels, road closings, bolo's (be on the lookout) for suspects we are searching for, or important news, then click on the link below and follow us.